Power & Motoryacht Magazine recently named their top twenty-five marinas in North America. Reviewing the list prompted us to recall our visits to several of them. Now that our children are living “On the Jersey Shore”, we are making plans to re-trace some of our steps. Our original adventure began in Salisbury, Massachusetts at Cove Marina (one of our top twenty-five marinas) and was planned as a two-week boating vacation. After meticulously planning our voyage, “HalfMine” and twelve of our closest boating friends, with their boats, escaped from the Merrimack River breakwater in July and turned south. Our armada of seven boats included “HalfMine”, “Desperado”, “Capricorn Two”, “Magic”, “Sea Duck”, “Out Of Service” and, of course, “Hoar’n Around” (we never go anywhere without our friends Erik & Victoria H.). Our boat sizes ranged from 28’ to 42’, and were manned by well-seasoned crews, all well acquainted with challenging boat trips and challenging conditions of epic proportions. This appeared to be just such a trip…we were headed for NEW YORK CITY! Our first stop was the Charles River in Boston for the 4th of July. Our stories have already been written and published about these annual treks (we now have seven to our credit). On this trip, suffice it to say, we lost our first traveling companions; Peter and Mary on “Out of Service”. When a sudden storm blew into and through the river, accompanied by high winds and pelting rains, their boat broke free of the anchorage, drifted back toward the Longfellow Bridge, collided with and nicely banked off of the Giant Glass yacht, then ricocheted into the sight-seeing vessel “Hannah Glover” out of Salem, both of which were anchored for the firework display. This episode caused considerable damage to the “Out Of Service” hull; the Giant Glass yacht and “Hannah Glover” were unharmed. After effecting suitable but unsightly repairs to their hull, Peter and Mary were forced to abandon the trip and return to Cove Marina; they were extremely lucky not to have been forced to abandon their vessel. After two nights on the Charles River, our remaining fleet headed for the Cape Cod Canal and Buzzards Bay. After refueling in Sandwich (only three of our boats; the remaining three had to stop in Onset; Sandwich had run out of fuel!) we headed for our remaining over-night stops in Woods Hole, MA, Newport, RI, Mystic Seaport and Milford, CT, with our final destination being Liberty Landing in NJ. On our return trip, we had scheduled stops in Montauk, NY as well as Old Saybrook, CT.
Our biggest concern from the very start of this adventure was: navigating Hell Gate in the East River in New York City. This narrow tidal strait on the East River had been reported to us as a serious challenge to our boating skills; we were wary of making this passage on our way to Jersey. In an effort to keep this story about our journey from becoming too much of “just a travelogue”, we have elected to mention just a few of the highlights we encountered (endured) during our two-week excursion. After leaving Mystic Seaport, we lost our second and third traveling companions. Due to heavy seas in Long Island Sound, “Capricorn Two” took some heavy water over her bow, causing the forward hatch to separate from the hinges, thus losing the glass hatch-cover overboard. The captain, Matty, chose correctly to reverse course and return, slowly and cautiously to Sandwich to effect repairs. From there he would make further plans, but he was not continuing on to NYC. Matty’s good friends aboard “Sea Duck”, Skip and Kathy, also chose to accompany them back to safer waters. Their adventures were to continue, just in another direction. Our remaining four boats continued east through Long Island sound watching as Long Island and Connecticut came closer together, eventually putting Throgs Neck Bridge into our scope of vision. “Desperado” was leading the way. However, as she approached the bridge, it became apparent to the vessels following her that she was heading into the shallow waters just north of the bridge opening. After hailing her to avoid this area, we were informed that she had noted some “GPS issues”. We believe there may have been “human error” involved as well. After passing under the Throgs Neck Bridge, we began our approach to the much feared and horrifically reputed…”HELL GATE”. The report of this highly anticipated encounter is hereby saved as a conclusion to our trips log. Of note, however, is that our friends Frank and Cheryl aboard “Magic” turned around before getting to Hell Gate; they said they needed to cut the trip short; Frank’s construction business needed him back, but…we believe they were very apprehensive about “the upcoming passage”. It is difficult to explain the emotions we encountered as we proceeded down the East River, noticing the lack of any boat traffic while watching the slow-moving, constant and harrowing vehicular traffic along the coast. It was a most pleasant, quiet boating experience, passing Riker’s Island, the UN building, making our way to the tip of Manhattan as we cruised between it and Governor’s Island. As we entered the channel to the Hudson River, we saw the Statue of Liberty. Boat traffic remained minimal as we circled the statue, took our photographs and passed close to Ellis Island on our way to our slips. We easily entered Liberty Harbor in Jersey City and proceeded to Liberty Landing Marina (justifiably one of PMY’s top-25 marinas in North America). We were certainly looking forward to our three nights at the marina as well as the three days of sight-seeing adventures in New York Harbor, New Jersey and New York City. The night-lights of Manhattan as viewed from Jersey City and Hoboken are indescribable; photos can only begin to describe the view, but photos are inadequate. It can only be seen to be fully enjoyed. One of our nights was very pleasant with warm temperatures, an extremely calm Hudson River and very clear skies. We decided to take our small inflatable dinghies “just to the mouth of Liberty Harbor” to better see the lights of the city. When we got to the mouth, it remained calm, clear and warm. We decided to continue “just a little further” out into the Hudson. Much to the disapproval of our mates, we continued across the width of the Hudson where we saw a large yacht docked at North Cove Yacht Harbor on Manhattan. We believe the yacht belonged to Chevy Chase, but we have been unable to confirm this belief…we may have “bumped into it” with our inflatables, by accident of course. 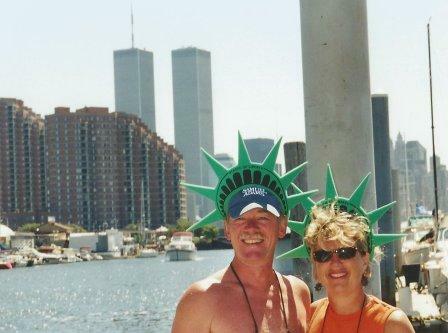 Our trip to NYC was during the summer of 2001; we have a picture of us, wearing our Statue of Liberty hats, on our dock at Liberty Landing…with the Twin Towers in the background. We have other pictures of the Towers as well. Little did we realize how soon they would be gone. Our return trip held many notable experiences, especially our stay at Star Island Yacht Club and Marina in Lake Montauk at the tip of Long Island. All we can say in this essay is that several of our experiences in Montauk we found to be strange and weird…more to follow in the future. 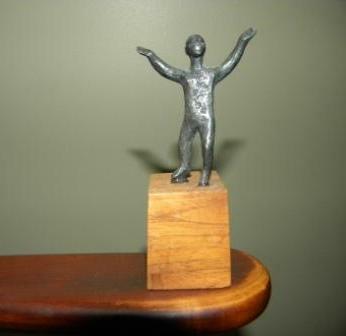 The Club did not make the PMY top twenty-five list, but in our view it should have. What we thought would be our final stop on our journey home was Between The Bridges Marina in Old Saybrook, CT. This also did not make the top twenty-five. Justifiably, we were worn out when we arrived late in the evening. Gang ways or gang planks are required to get onto and off of your boat while docked at this marina. We did not bring a gang plank with us. When we asked about this, we were instructed that we could use any on the docks not being used by another boat; we borrowed one for the one night. Subsequent to our “borrowing”, we were informed by the owner of the gang plank that they were NOT community property and that NO WAY were we to use HIS. The marina was pretty well empty (this being a Wednesday night); he may well have been the only owner who came by to check his boat. To say the least, this encounter by two, other-wise calm and collected individuals, was loud, obnoxious and unacceptable by any standards. This was not an enjoyable “last stop” to our vacation. It was, however, notable. And, it did not turn out to be our last stop. Entering the Cape Cod Canal from the west was rough but did not present a problem. As we approached the east side however, the seas looked extremely challenging. We did exit the canal and proceed north toward our home port; the seas disagreed with us during this effort. Late in the afternoon, we abandoned our efforts outside of Scituate. We entered the harbor and obtained moorings for the night. We were done-in, beat up and done with the trip; we only wanted to get home and sea conditions were preventing us from doing that. We did not enjoy Scituate as much as we could have, had we not been forced to take refuge. We ate dinner ashore and went to bed early. The morning came and the sea showed no remorse for us; it was again too rough to leave the moorings. We stayed an additional night; luckily, we were able to return home in the morning. Our return was uneventful and landfall at our home port in Salisbury was gratefully appreciated…we were glad to be home. There were many more stories developed during this two-week vacation trip to New York City; more than can be told here. With little doubt, this was a trip of epic proportions which we will all remember…forever; especially those of us who completed the entire journey: “Desperado”, “HalfMine” and our friends on “Hoar’n Around”. Oh; I forgot…”HELL GATE”! Of all the experiences we had on this voyage, Hell Gate was the most forgettable; totally anti-climactic. The “narrow tidal strait” was so calm we almost missed it; we knew we had been through it only when we identified the Hell Gate Bridge. Either we are totally missing something here or those who call this “a challenging area” have never been through the mouth of the Merrimack River when it is rough…and it is rough most of the time. great story. we love adventures with you guys . As always, a thoroughly enjoyable story! Love reading these!!! What year was the NYC trip? I remember a great wind storm around the 4th of July. The year would have been 1996 or so. We were between Cape Ann and Provincetown between 8:00 and 9:00 am in a 27′ Albin Aft Cabin. It was the scariest storm I’ve been in. Many sailboats were blown over. Thankfully, the worst of it only lasted about 20 minutes. Thanks for the comment Roy. Our trip was in 2000; it was perfect weather; seas in Buzzard’s Bay kicked up on the way home but we missed the storm you are talking about…BUT, we have been in scary storms once or twice.